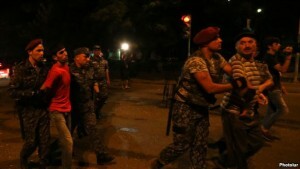 Armenian security forces captured early on Wednesday four more gunmen who have been holed up in a police station in Yerevan for more than a week. The spokesman for the Armenian police, Ashot Aharonian, said one of the leaders of the gunmen, Pavel Manukian, and his son Aram were wounded in a shootout with law-enforcement officers. One of the officers was also wounded as a result, Aharonian wrote on his Facebook page at around 2 a.m. local time. “All three men were immediately taken to hospital,” he said. Aharonian added that two other members of the armed group affiliated with a radical opposition movement, Founding Parliament, surrendered to security forces deployed around the police station in Yerevan’s Erebuni district. “At the moment the skirmish has stopped and negotiations are underway on completing the surrender of the armed men,” he said. Shortly before midnight, the police spokesman claimed that the gunmen have opened “sporadic fire in various directions.” It was not clear whether the Armenian police or the National Security Service were attempting to storm the sprawling compound. 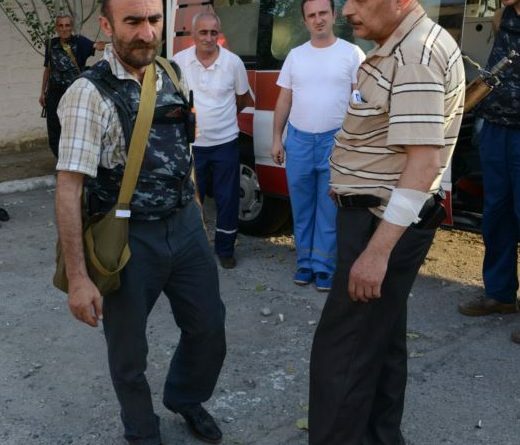 Manukian and his wounded son underwent surgery at the Erebuni Medical Center. The entrance to the hospital was guarded by masked policemen armed with assault rifles. Manukian’s daughter Aspram was among several relatives of wounded gunmen anxiously waiting outside the hospital in the early hours of the morning. None of them was allowed into the building. Hospital doctors told journalists that both Manukian and his son were wounded in the legs and remained in a “serious but stable” condition after being operated on. Two other gunmen were also shot in the legs before surrendering to the police early on Tuesday. The nature of the gunshot wounds suggested that the law-enforcement authorities are keen to avoid killing any of the armed oppositionists. The armed group reportedly numbered around 30 when it stormed and seized the police station on July 17. About an hour after news of the security operation was announced, riot police detained at least two dozen people who continued to demonstrate in support of the gunmen on an Erebuni street section close to the seized police station. The police gave no reasons for the detentions. The street section has been the scene of daily protests staged by Founding Parliament and its opposition allies for the past week. Thousands of people rallied there on Tuesday evening. The protest leaders urged the crowd to disperse shortly after midnight. Only several dozen people remained there by 2 a.m.